WordPress 4.8, What’s New & What’s Better? Yesterday, the team behind WordPress made their first major release of 2017 – WordPress 4.8, dubbed ‘Evans’. With this being a major release, you’ll need to login to WordPress and update manually. Remember to make a backup of your site before doing so – we recommend contacting your web host if you’re not confident in doing this yourself. So What’s New in WordPress 4.8? WordPress 4.8 incorporates a range of new features, some more apparent than others. The main introduction is a range of new widgets – ‘Image Widget’, ‘Audio Widget’ and ‘Video Widget’. 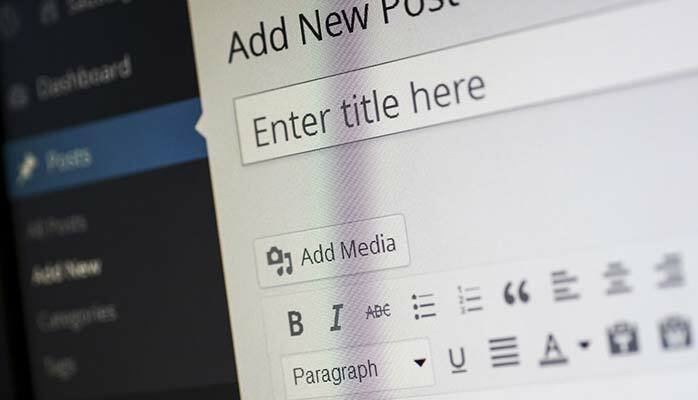 Before WordPress 4.8, users would need a basic understanding of HTML code to be able to include images or audio/files in the standard text widget that comes with WordPress. As of 4.8, users now have three new widgets that allow you to access your Media Library and insert files or embed them from an external link like Vimeo or YouTube. Because of the ability to embed videos from external sites, we always recommend you upload video files to YouTube, Vimeo or a similar platform – large files will increase the amount of server space your website uses and can cost you more money. This is best described by the makers of WordPress themselves – they’ve also produced a video to properly demonstrate the new link boundaries feature. WordPress has a huge offline presence and numerous events are hosted every single month, both here in the U.K. and overseas. 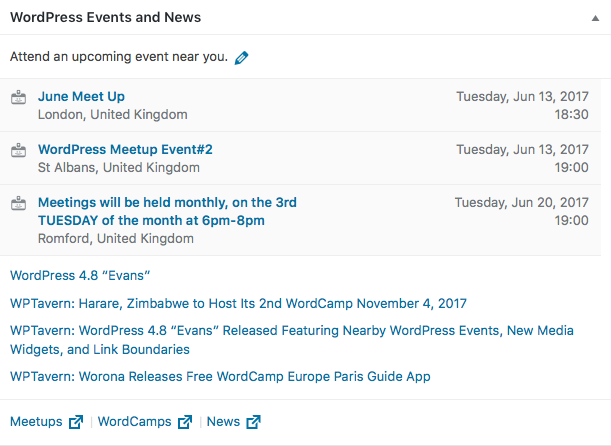 WordPress 4.8 introduces the ‘Events and News’ dashboard widget. Once you login to /wp-admin/ you’ll have a dashboard widget that lists some upcoming events in your country. 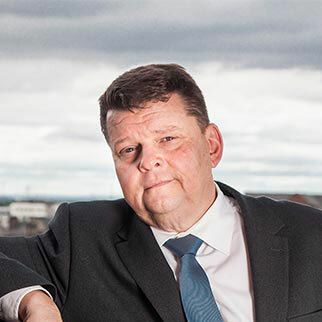 In America, where there’s more events, you might find more events closer to you but at time of writing, we’re based in Middlesbrough and the latest event listed in WordPress is in London (c.250 miles away). WordPress guesses your location based on IP address, locale and timezone, therefore if your website has multiple users in different locations, they’ll see events closest to them. For many, this update will make no difference but it will affect some. Web browsers are dropping support for Silverlight and subsequently WMV and WMA files (video and audio files, respectively). Where previous versions of WordPress would allow you to embed these filetypes straight into your website and play them so long as you had a Silverlight extension in your web browser, 4.8 does not. Instead, any WMV or WMA files are downloaded on click, rather than played. Going back to widgets, the ‘Text Widget’ now features a streamlined TinyMCE editor. This is the WYSIWYG (What You See Is What You Get) editor that you have when using the Visual Editor to add content to your WordPress pages and posts. Previously, you had to have some code prowess to be able to add any sort of formatting or links to text widgets. The 4.8 update allows you to add lists, hyperlinks and format your text with an almost identical interface to the one you would see when editing your pages and posts. You might have previously made changes to your WordPress theme through the live customiser. There’s no great changes here, only that the width of the customiser sidebar has been changed on larger screen. Previously, it was deemed too narrow but not anymore. Break out the bunting. Tag code for clouds have been tweaked. Previously tag clouds would use the HTML title attribute, where now they’ll use the more accessible aria-label attribute. ARIA, Accessible Rich Internet Applications, is a set of attributes now used across the Web to help web browsers provide your content to users using assistive technology (like the ‘Reader’ option in Safari). Also as of WordPress 4.8, once you navigate to ‘Users’, the user’s name as well as their login name will be prominently shown in the listing of information.